A tapir is a large, herbivorous mammal, similar in shape to a pig, with a short, prehensile snout. Although pig-like in appearance, their closest existing relatives are the horses and rhinoceroses. There are five species of tapir: the Brazilian tapir, the Malayan tapir, the Baird’s tapir, the kabomani tapir, and the mountain tapir. They inhabit jungle and forest regions of South America, Central America, and Southeastern Asia. Adaptable to different habitats, tapirs may be found in swamps, forests, savanna, and rainforests. All tapirs prefer wooded or grassy areas with places to shelter during the day and a lake, river, or pond for taking a nighttime dip. The natural lifespan of a tapir is approximately 25 to 30 years, both in the wild and in zoos. The Malayan tapir (Tapirus indicus) is the largest species of tapir; it is from 1.8 and 2.5 meters (5 ft 11 in and 8 ft 2 in) in length; 90 to 110 centimeters (2 ft 11 in to 3 ft 7 in) in shoulder height; and weight between 250 and 320 kilograms (550 and 710 pounds). The kabomani tapir (Tapirus kabomani) is the smallest species of tapir; it is roughly 130 centimeters (51 inches) long; 90 centimeters (35 inches) in shoulder height; and weight about 110 kilograms (240 pounds). Group of tapirs is called a "candle". Male tapirs are slightly smaller than females. Their coats are short and range in color from reddish-brown, to grey, to nearly black, with the notable exceptions of the Malayan tapir, which has a white, saddle-shaped marking on its back, and the mountain tapir, which has longer, woolly fur. All tapirs have oval, white-tipped ears, rounded, protruding rumps with stubby tails, and splayed, hooved toes, with four toes on the front feet and three on the hind feet, which help them to walk on muddy and soft ground. The tapir’s nose and upper lip combine into a flexible snout like an elephant’s trunk. They use it to grab leaves from the nearby branches, pick up the fruit from the ground or to find aquatic plant on the bottom of the water. When frightened, tapirs can take to the water and breathe with their snout poked above the surface like a snorkel. 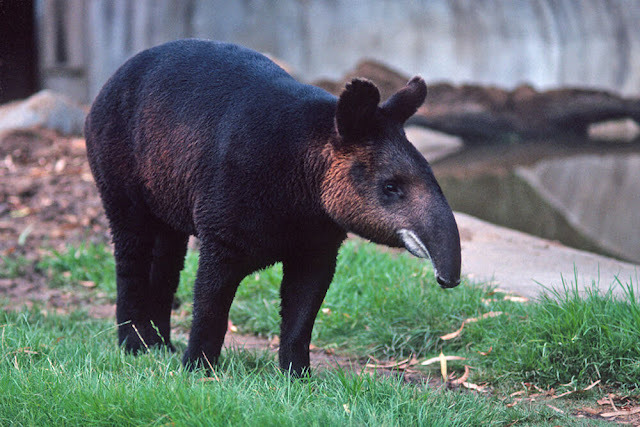 The snout also adds an air of mystery to the tapir—at first glance, it’s hard to tell just what this creature is! Tapirs are surprisingly nimble and are excellent at scrambling up steep riverbanks. They can also run and swim. It is thought they walk along river bottoms, much like hippos do. Tapirs can run fairly quickly with the top speed of 48 kilometers (30 miles) per hour. The tapir is a herbivore and spends it’s time browsing for food to eat. The tapir eats leaves, twigs, branches, buds, shoots, berries, fruits and aquatic plants. Tapirs are known to eat up to 34 kilograms (75 pounds) of food per day. Their diet gives them an important role in the ecology of their forest home: seeds passing through their digestive tract help reseed for a new generation of plants. The tapir has an excellent sense of smell and hearing, but does not have very good sight. Tapirs are nocturnal and crepuscular animals except the Mountain Tapir which is more diurnal, active during the day. Apart from mothers and their young offspring, tapirs lead almost exclusively solitary lives. After a gestation period of 13 months, the female tapir gives birth to a single tapir baby (twins are rare), called a calf. The calf’s eyes are open, and it can stand one or two hours after birth. Even though there are differences in habitat and geography, all tapir calves look like brown- and beige-striped watermelons on legs. The pattern is good for camouflage, but they lose the stripes as they get older. Young tapirs nurse as long as the mother provides milk or until she is ready to have another offspring. Adult tapirs are large enough to have few natural predators, and the thick skin on the backs of their necks helps to protect them from threats such as jaguars, pumas, crocodiles, anacondas, and tigers. The four species that have been evaluated (the Brazilian, Malayan, Baird’s and mountain tapir) are all classified as endangered or vulnerable. Tapirs are among the most primitive large mammals in the world today. They’ve been around for 20 million years and have changed very little. The first fossil record of tapirs is found from the Early Oligocene period (65.5 million to 23 million years ago). Fossils of tapir ancestors have been found on every continent except Antarctica. Tapirs even lived in Southern California about 10,000 years ago. The word tapir, translated from a Brazilian Indian language, means “thick,” referring to the animal’s tough hide. In Indonesia, the word “badak” refers to both rhinos and tapirs. In Thailand, “P’som-sett” is the name for tapir and it means “mixture is finished.” This refers to the belief that the tapir was created from leftover parts of other animals. In Chinese, Korean and Japanese, the tapir is named after a beast from Chinese mythology, known in Japanese mythology as the Baku (spirit). In the prehistoric sequences of the science fiction film 2001: A Space Odyssey, tapirs appear alongside primitive hominids in Africa.